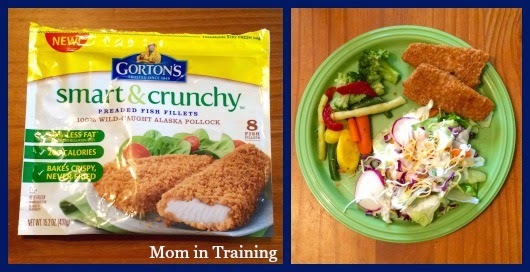 My family and I had the NEW Gorton's Smart & Crunchy fish fillets for dinner tonight and I have to say they were delicious! I've never been the biggest fan of fish, and I will be the first to admit that. But ever since I've been a part of the Gorton's Crew I've had the opportunity to try several that I've actually really liked. From baked to grilled I've actually had several different kinds of fish as well as variations of them. So far out of them all I think I like the Smart & Crunchy fish fillets the best. They bake up nice and crispy and don't get greasy at all in the oven like some breaded fish sticks/fillets do. We had them for dinner with some steamed veggies and a salad and it was a perfect meal. Now that I've had the fish fillets I want to go back and get the fish stick version too and see how they cook up. The Gorton's Crew has exciting news! We have reinvented our iconic Fish Stick, to create the Fish Stick 2.0. Our all new Smart & Crunchy Fish Sticks and Fillets are made from 100% Alaska Pollock and are never fried, so they have 50% less fat than Gorton’s regular breaded Fish Sticks and Fillets. And, thanks to a seasoned panko crumb, they have the same great taste and crunch you and your family have come to love from Gorton's. All new Smart & Crunchy Fish Sticks offer a mealtime solution that you can feel great about serving and your family will truly enjoy. We're excited to spread the word to families across America, so we're hitting the road on a sampling tour. 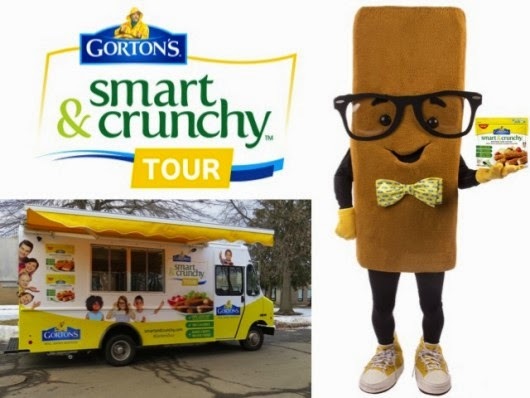 Check out the #GortonsTour stops on our website, smartandcrunchy.com. We encourage you to take a peek and share with your readers as we continue our trek across the U.S. Perhaps we'll see you or some of your readers! 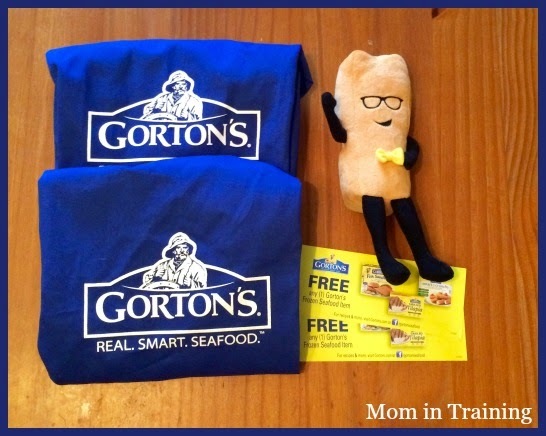 Win it: One lucky reader will win a Gorton's Prize Pack (2 full-value product coupons, an adult-size apron, a child-size apron and a Smarty Crunchman plush toy). This giveaway will end April 14th at 11:59 PM EST. The winner will have 48 hours to respond to my email. If no response, a new winner will be chosen. Open to residents of the US. My favorite is salmon, but as long as I have coleslaw, I can eat any fish. I love the grilled salmon. My favorite type of fish is haddock. I LOVE sea bass and salmon! My favorite type of fish is salmon! Salmon is my favorite type of fish. Cod is my favorite type of fish. I like the beer battered fillets from Gortons. Im not sure what type it is. My favorite is tuna. It's versatile. My favorite is salmon. But I also like catfish and haddock. Tilapia is one of our favorites. My favorite is salmon, especially when it's grilled. Thanks. I like perch or tuna best. My favorite fish is salmon! Fresh ahi tuna would be my all-time favorite. I like tuna and salmon.